The brilliant streams of light are beginning to find their way through the potentially foreboding clouds. 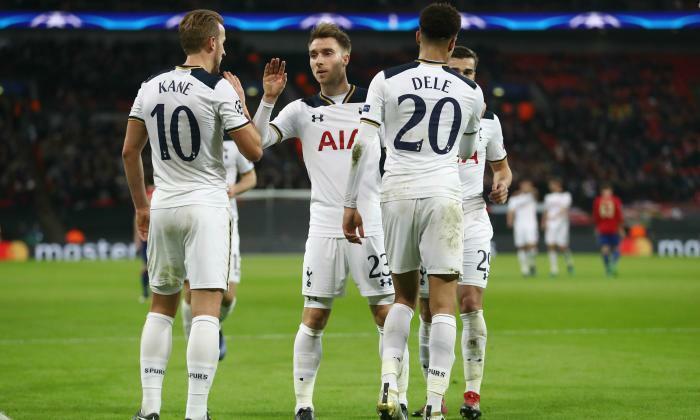 Tottenham seem to be awakening from a dozy, clumsy period of form which saw them win just one game in nine. While a slightly acidic taste may still linger in the mouths of many who watched us nonchalantly bow out of the Champions League with nary a whimper – the overall perspective of Tottenham ahead of our trip to Old Trafford and in the period following should be overwhelmingly optimistic. So let’s linger on that negative for a bit, get it out of the way so I can drench you with pleasantries for the rest of the article. The Champions League. We blew it. It was a little depressing pulling on my (quite expensive) Harry Kane top with Champions League badges and lettering this morning, knowing that it will be a reminder of a very poor campaign in years to come. That and the player’s name that I spent an extra £25 on was barely in attendance throughout – no fault of his own of course. It was just a pain to watch some of those games. The first match against Monaco can almost be forgiven as it was almost bound to be disappointing. Considering how much excitement and promise the club has built around the occasion, we as Tottenham supporters should have been wary of expecting anything nice to happen to us. First game jitters aside though, the rest of the campaign really should have yielded more points and at least a second place finish. Really, truly poor displays against Leverkusen and Monaco left us tumbling helplessly down the slippery slope and through the third place trap door and back into the Euro League - which we all love so much and never wanted to leave in the first place! This morning I, like many around the globe woke up rather early and pottered about trying to find an even halfway adequate not-quite-legitimate live-stream of our game against CSKA. I checked Twitter and found that the line-up Poch had chosen to come out and play at Wembley was far stronger than what I think most of us were suspecting. There were no starting places for Sissoko, Trippier, Wimmer and N’Koudou and Harry Kane was going to play from the beginning. This side was the side we should have played against Monaco when our survival in the competition was still a viable outcome. I don’t understand how a game against Chelsea, the league-leaders on tremendous form would take more precedence than a much more winnable game against Manchester United where we could put a serious gap between the chasing pack. Why the turn around? Why go for it when we could have probably have comfortably won with a vaguely second-ish side and save our players for an important game on the weekend? Perhaps we really did need to properly win a game at Wembley to rid this silly curse, perhaps the players have been playing really well together and he didn’t want to stifle that momentum, or maybe the club just wanted to see us out of the Champions League with a stirring result. Either way I was glad we won, and especially in the manner we did. But I am hopeful that we don’t show signs of tiredness against a Manchester side who are coming into this fixture with a ‘must win’ attitude. So we won our last game, but still left the competition with little more than a whimper. There is a caveat to all of this disappointment however. We’ve all been talking about it for months now, but I think some fans are still semi-unaware of just how important an aspect of football it is. Injuries. This really does need a long hard looking at in any discussion of our poor recent form or disastrous Champions League elimination. For half an hour this morning we were blessed to see Harry Kane and Toby Alderweireld on the pitch together. This is a really big deal as you no doubt already know. Any discussion of ‘Pochout’ hashtags must be swiftly dismissed with this one piece of information: Harry Kane and Toby Alderweireld have been injured, badly, for ages. It’s really that simple. Harry had a slow start to the season, and there is no wonder that he would considering that he has been playing football every day for the last five years – and perhaps that injury to his ankle has been a blessing in disguise. The guy is expecting his first child and has not had a break for so long to spend with his soon to be growing family. He is a young lad and he seems very grounded and sensible in this regard and you can only imagine that lack of rest and relaxation would eventually produce some unhappy peak. Since coming back against Arsenal he has looked to really be hitting his stride again and producing some very classy performances and scoring important goals. His effect on the team cannot be underestimated, not only for morale but the way he allows players like Eriksen and Dele to perform and move about. It is so great to have him back. As for Toby, that feeling of pure bliss when I saw him take off that training bib and slip into the lilywhite was coming for way too long now. What was an apparently super serious, and then not so serious and then annoyingly serious injury is behind him. He was on the pitch, running around, kicking the ball. He will start against Manchester United. Everything is going to be alright guys. Much like Kane, Toby’s immense influence isn’t focused solely when he is on the ball; his awareness, direction and confidence boosting for the players around him is almost as important as the tackles, interceptions and passes he makes. He is a truly fantastic player and we should savour every moment we have with him in our team. Now the wider point here and the point of this article in general is to discuss the need for perspective around this period of quite poor results. As my last article noted, it could have been a lot worse for us, many of those draws could have been losses! But as far as I am concerned, the results that we managed and our place in the table now is actually quite extraordinary considering the bad luck we have had in regards to injuries. Even the injuries themselves were examples of terrible luck, they weren’t thigh strains or groin injuries due to fatigue – they were simply unlucky knocks or unfortunate twists. As was mentioned on the pod a few weeks back, you wonder how a squad like Chelsea would be doing without Diego Costa, Gary Cahill and Eden Hazard. Or how Woolwich would be doing without Sanchez and Koscielny. We are, realistically, smaller clubs financially than these two. We have not had the resources or time to be able to properly accommodate for such terrible injury spells for our two most important players. The rest of the squad has struggled with fitness as well! Dele Alli, Erik Lamela and Mousa Dembele have all had torrid luck with injuries this season and they’ve all conspired to do this at the same time. Its why I take real issue with the contingent of fans that have been so boringly morose and negative about Tottenham this season. Already forgotten are the amazing feelings the club gave us last season and we are back to expecting too much and bitching when we feel let down. I’ve said it before and I will say it again – PERSPECTIVE is key here. BIG PICTURE stuff. Ok, so the Champions League is over and the hectic Christmas period is upon us. I say bring it on. I think Tottenham are in a really excellent position to put together some great results and once again challenge for the title, if not cement ourselves within the top four where we belong. Look at the clubs around us, yes Chelsea are doing something pretty impressive at the moment and perhaps they have the unhindered momentum to go all the way this season. But look how well we pushed them in that first half, there is no doubt in my mind that if we had a full strength squad we would have won that game. The same with Arsenal, they were lucky to catch us under-strength and with a full complement I feel we would have been too much for them - we have been better than them in the last couple of seasons but our head to head results are not clearly stating that. They do look a threat going forward this season but surely one of their stars will be due a period of injury or poor form soon and they will begin to falter. As for Manchester City? Well, I think we all remember how we brushed them aside earlier this season and their defensive frailties look to be a real problem for them coming into this busy period – not to mention the loss of Aguero for that disgusting tackle. On that note… how come Dembele got a ten game ban (later reduced) for sort of touching a guy’s face but Aguero gets only four games for a tackle that easily could have broken a player’s leg in three places. I don’t get it. Either way City will be without some key players in this period and may drop important points. Liverpool look to be finally showing some of their true colours as well. Their stunning deficiencies at the back will surely start to damage any chances they had at claiming a title and I feel one of their classic falls from the top will come within the next few months. So that leaves us in pretty good stead right? We are still missing Erik Lamela, which is a blow to be sure. He is an important player for us. But with Son in great form, the Argentine’s absence will be felt less. More importantly a couple of player’s form seems to be peaking again which will be vital going forward into the new year. Both Dele Alli and Christian Eriksen look to be back to their best. The result against Swansea and then at Wembley in the Champions league were both testament to these player’s great performances. Christian Eriksen in particular is showing us all why he has been so important to our club for the last few seasons – his passing against CSKA was exemplary and he seems to have found his shooting boots once again with some great strikes against Swansea and a real belter against Chelsea. On top of these regulars looking great again, Poch has kept up his brilliant record of bringing young players into the mix. Harry Winks looks like a genuine player rather than a charity case. His dream home debut goal will not be forgotten, but his general passing and movement on the ball looks like a real asset. I really think we can beat a lacklustre Manchester United at Old Trafford. At the time of writing it is still unclear whether they will be travelling to Eastern Europe for their Europa League clash due to bad weather, so we may lose that advantage. But regardless of that, we have the strength in midfield and such a solid backline that I don’t anticipate United’s superstars being able to trouble us too much. If we can see United off - even a good performance and a draw wouldn’t be that bad in the scheme of things – I think we will have such a good momentum together that we could be in third place by New Years. Everything has fallen back into place for Spurs; we have our two best back, we have our creative players starting to play confidently and our solid midfield and defence is complete once more. Yes it was a poor run, but it had to end sooner or later and now we are ready to push forward boldly. You can follow me at @loque91 or on the E-Spurs Australian Twitter account at @e_spurs_aus COME ON YOU SPURS.